This is our 2nd newsletter for 2010. We’ve enjoyed a very good start to the year in spite of the depressed economy. We’ve been working very hard with our clients, juggling investigations along with trial preparations on a number of Capital cases. The fact that we have such a large and diversified staff is what makes this all possible. We have had some great results so far this year which are outlined in the newsletter. I sincerely appreciate our clients who continue to refer business to us. I would like to thank Katherine Scardino, David Adler, Bob Loper, Gene Tausk and Lynn Shannon for referring new clients. Special thanks to my old friend and buddy, Rob Fickman, who referred three new clients. Since our office is only twenty miles from the Montgomery County Courthouse, we have started to get work in that jurisdiction. We have some experience in that area, having worked with James Rytting on the Swearingen Stay of Execution and working Capital cases with Robert Morrow, Gerald Bourque and Katherine Scardino. We have had a number of successes with local attorney, Gilbert Garcia. The other day I was in Montgomery County with Katherine Scardino on a Capital case involving a Defendant who is deaf and only speaks sign language. While I was standing in the Reception area of the District Attorney’s office waiting to receive the file to review, District Attorney, Brett Ligon walked through the door, giving me a very warm greeting. My relationship with Brett goes back a number of years when he was the attorney for the Houston Policeman’s Union. We provided investigative support for his cases. Also in the lobby was attorney Gilbert Alvarado. Brett introduced me to Alvarado as one of the best investigators in the business, who provided clients with very detailed reports and work product. Brett even made the comment that I put out a newsletter highlighting our results. The accolade from Brett certainly was much appreciated and I could not resist putting what occurred in the newsletter. Angela Willis came aboard in February of this year as an Investigator. Angela grew up in La Marque, Texas, graduating from La Marque High School. She has nine years of Police experience as a Patrol Officer, Patrol Sergeant and Detective. As a result of her years in law enforcement, Angela has a firm grasp on Police procedures, the interaction of the Penal Code with what occurs on the street and how Police document their activities. Angela has proven to be a very competent interviewer, who has the patience and skill needed when talking to witnesses that allows her to obtain any and all of the information they may possess. Angela has training in the recognition of body language and other tell-tale signs that would indicate when an individual is being truthful or deceitful. In addition to all of Angela’s qualities, being female just adds another dimension to our already diversified staff. Another of Angela’s strong points is her ability to investigate, research and utilize all the Internet sources available, which some of us old timers are not very good at. Angela has also shown the ability to handle sexual offense cases with the delicacy it requires to gain information. We are very happy she has come aboard as a member of our team. We were all disappointed to hear that the Administrative Judges were going to cut Appointed Attorney fees for a 2nd time and now have included an hourly reduction for investigator fees. We plan to continue to do appointed work since our client base is diversified enough to allow us to continue these efforts. It appears that our efforts on each defendant’s case may have to be more streamlined. It really has been amazing the number of successes we have had in this arena by pursuing these cases to their limits. Recently, when interviewing a Capital Murder defendant, he bragged that prior to his arrest he “had it all.” When I asked what he meant by the statement he answered “I had plasma TVs .” When I responded with a straight face, “No way, you are twenty years old and you had plasma TVs?” He replied proudly, “I had three plasma TVs and Direct TV. The defendant further lamented that when he lost his job and could not pay the Direct TV bills, the service was cut off and he decided to try a life of crime to earn extra money. I explained that his choice of how to earn extra money probably wasn’t a very wise decision and the Direct TV defense would probably not be sufficient for an acquittal. The World Investigative Conference was held in March at the Sheraton Inn in Dallas. 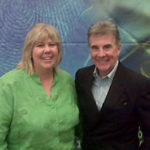 The keynote speaker was John Walsh of America’s Most Wanted. In addition to myself and Carey Wellmaker, Benito Segura and George Wellmaker attended the Conference with us. We attended lectures regarding interviewing and statement taking, international investigations, Internet profiling and intelligence, corporate fraud investigations and other subjects. We left the Conference with a lot of newly acquired information and training. We also had an opportunity to network with current and new contacts. Carey waited in line to have her picture taken with John Walsh. 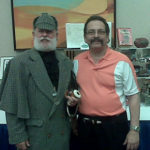 I did not wait in line to have my picture taken with Sherlock Holmes. At least I thought it was Sherlock Holmes but I later found out it was the curator of the National Private Investigator Museum located in California.